This week, the Six-Kilo-Cat developed her annual fussy-with-furballs problem, necessitating the administration of twice daily tablets, Cat-Lax paste and a whole new menu. Scratched-up and emotionally crippled by the ordeal, I took myself to the shops in search of new cat chow – something to hide tablets in, chiefly. 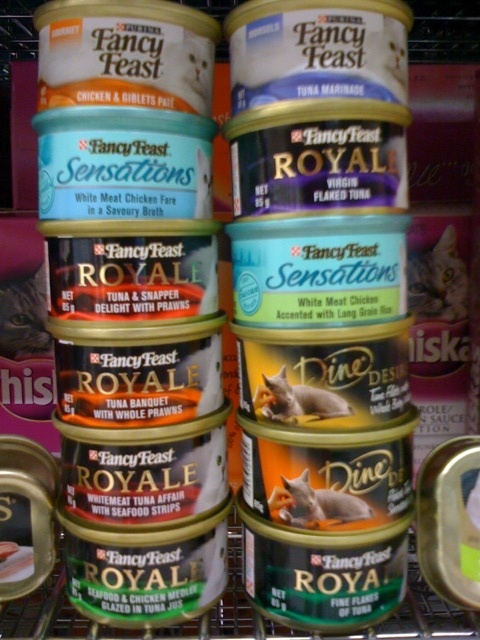 To this point, I’d managed to stay within the Kia-to-Corolla range of cat food, but desperation finally brought me to the Rolls Royce of kitty cuisine. * a delight, affair or banquet? * Beef offal with cereal. As the kids insightfully point out, the cat can’t read. However, after all the fuss and big-spending on new food, the kids also advise me that the boss only eats what comes out of light pink tins and still spits out the tablets. Go figure.